The Porsche Mission E Concept. The electric car startup would-be Tesla-killers of the world may soon find themselves facing stiff competition from a well-established player in the luxury automotive world. Porsche said this week that it’s doubling its previously announced investment in hybrid and all-electric cars to $7.4 billion, according to multiple reports. 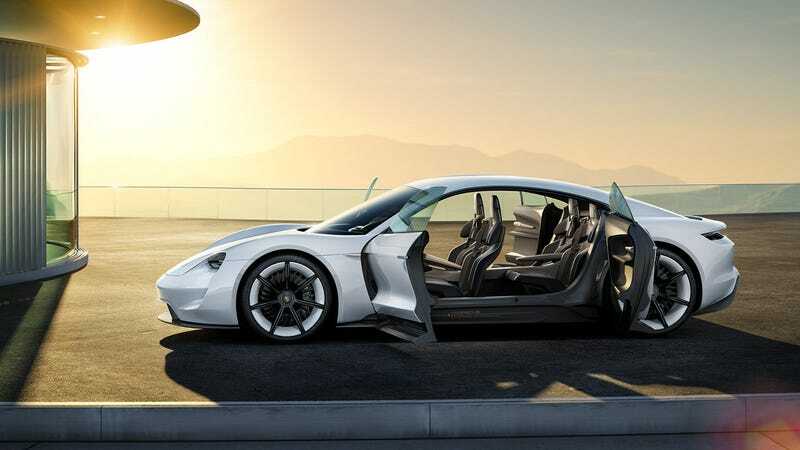 In particular, Porsche plans to spend about $620 million for the development of variants of its fully-electric Mission E sports car, according to Business Insider. As we previously noted, the car’s expected to have somewhere close to 670 horsepower, one of three grades under consideration. Porsche’s investment is just the latest play by a traditional luxury and performance brand to come up with a true rival for the automotive wing of Elon Musk’s business empire. Porsche’s additional $3.7 billion investment will be allocated to multiple development programs already underway. This includes $620 million for the development of the Mission E high-performance electric sedan and its derivative model. Another $1.2 billion will go towards the hybridization and the electrification of Porsche’s existing internal combustion models. And $868 million will be used to expand facilities while another $868 million will go towards the development of charging infrastructure. The massive investment in charging infrastructure’s a big deal, if Porsche wants to catch up to the likes of Tesla’s Supercharger network. That’s been the key separator for Tesla—but if Porsche comes out with a 1-2 punch of an actual competitor to the Model S and a charging network to support it, that could present a serious problem for Tesla. With countries like China setting the tone for electric cars in the industry, Porsche has suggested in the past year that it’s trying to make a play for the electric car market there. The government, in particular, has said it wants 20 percent of cars sold in the country by 2025 to run off alternative fuels, according to the New York Times. In response to China’s implementation of strict emissions regulations, and in advance of that, Porsche showed off the new plug-in hybrid Panamera at last year’s Shanghai Auto Show. As Business Insider points out, the Mission E is expected to arrive next year with a base price that’s aligned with the Model S starting MSRP of $74,500. Porsche claims the Mission E will be capable of getting 400 to 600 miles of range on a single charge.